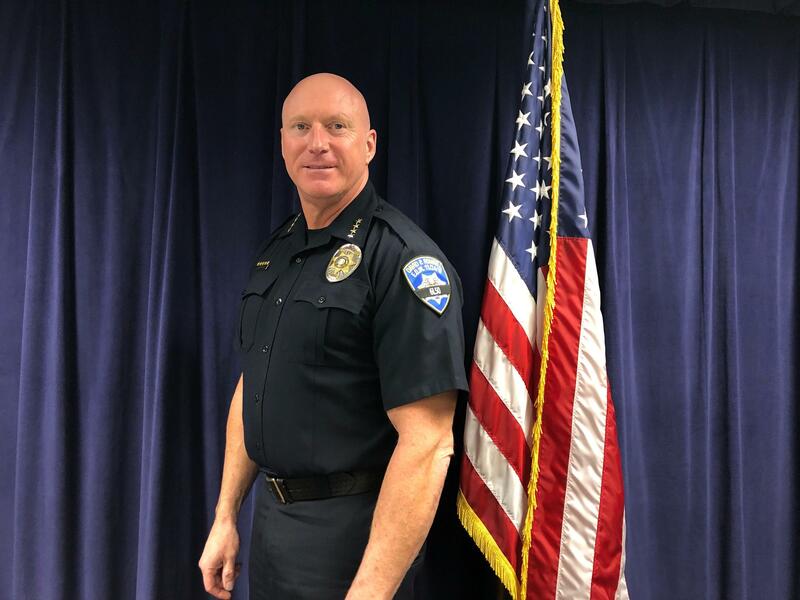 The South Salt Lake Police Department has added a new patch to its officers’ uniforms as they continue to mourn Officer David Romrell, who was killed by a burglary suspect two months ago. Romrell’s November death shook the entire department. He was the first officer from his department to be killed in the line of duty since the department was formed in 1938, said Police Chief Jack Carruth. Carruth said he felt like they needed to do something to show they have not forgotten Romrell. Romrell was struck by the car of a suspect fleeing a burglary scene. He was taken to Intermountain Medical Center where he died. He was 31 years old when he died. He joined the department in January 2018. South Salt Lake Police Chief Jack Carruth. Even though he was on the force for a short amount of time, Romrell showed a lot of promise, Carruth said. Before joining the department, Romrell was a Marine Corps sergeant and had worked as a private investigator. The patch features Romrell’s name, the date he was killed and his badge radio call sign. South Salt Lake officers will wear this patch on their left shoulder, close to their badges and their hearts, Carruth said. “It’s part of the healing process for our officers, something that can give them pride and a way of honoring David as well,” he said. Romrell is survived by his wife Elizabeth and their 5-month-old son. Along with the patch, Carruth said the department is also converting Romrell’s locker into an informal memorial complete with pictures of him. The locker will not be reassigned to another officer, he said. “That’s just small things to give back to our officers so that they see that what they are doing doesn’t go unnoticed and it continues to give them that drive and that courage to serve,” Carruth said. Correction: A previous version of this story stated that the South Salt Lake Police Department was formed in 1983. It was formed in 1938. Family and friends of David Romrell gathered to honor the late South Salt Lake Police Officer on Wednesday, remembering him as a determined and genuine public servant. West Valley City police are mourning the death of 25-year-old Officer Cody Brotherson, who was killed in the line of duty early Sunday morning. He was struck by a stolen vehicle around 3 a.m. on Sunday. Brotherson’s funeral is set for 10 a.m. November 14 at the Maverik Center in West Valley City.